The 2018 Toyota RAV4 is a five-passenger compact crossover SUV built for both adventure and utility. Whether you decide on the 2018 RAV4 or the 2018 RAV4 Hybrid, you are choosing a well-equipped vehicle that has proven to be a North American favourite for over a decade. The 2018 RAV4 comes in six trims: LE, XLE,Adventure,SE,and LimitedandPlatinum, all of which come standard with a 2.5-liter four-cylinder engine that produces 176 horsepower and 172 pound-feet of torque. Choose the trim level that best represents your personality; for example, the Adventure was made to take you off the beaten- path while the Platinum satisfies your need for luxury amenities and features. Front-wheel drive is standard across all RAV4 trim levels as is a six-speed automatic transmission. Many Canadians opt for all-wheel-drive, an obvious choice for our less- than-predictable winters. 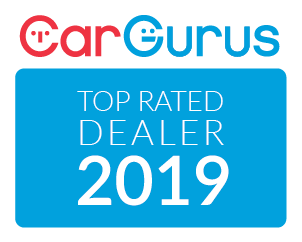 Standard features include a rearview camera, a 6.1-inch touchscreen interface, one USB port, Bluetooth, and a six-speaker sound system with a CD player and an auxiliary audio jack. The RAV4 sports 60/40-split folding and reclining second-row seats as well as a height-adjustable driver seat. Toyota Safety Sense P also comes standard: Lane keeping assist, adaptive cruise control and automatic high beams are just some of the high-level driver-assisted technologies included. More amenities are added with each additional trim, including a height-adjustable power liftgate, driver-seatmemory functions, an auto-dimming mirror and many more. 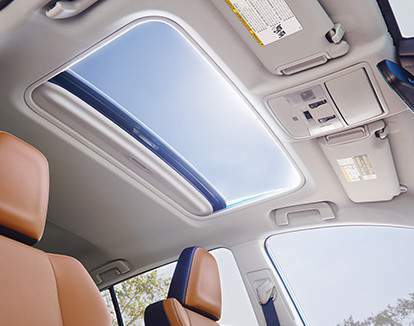 Inside, the RAV4 meets every expectation. The dual-zone climate control quickly cools passengers on a hot day while the available heated seats warm you up in the winter. A low step-in height and tall doors make it easy for all your passengers to enter and exit. The RAV4 also offers one of the largest cargo capacities in its class, and thanks to a strategic design, loading and storing all your items is a breeze. 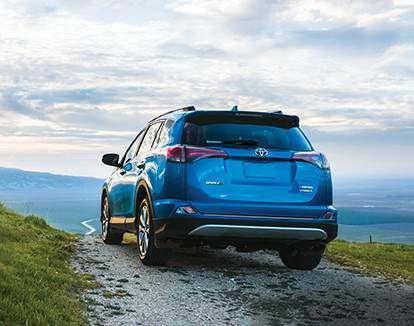 The 2018 RAV4 Hybrid is both stylish and efficient and houses the most advanced technology in the industry. Featuring a hybrid powertrain that delivers an unprecedented 7.3 L/100 km, you can travel long distances with confidence. And with the RAV4 Hybrid’s unique gauge cluster you can monitor the Hybrid Synergy Drive system with a quick glance. You can also track when the system is charging and providing power to the drive wheels, so you can get the most out of every trip. Shopping for the perfect five-passenger SUV? 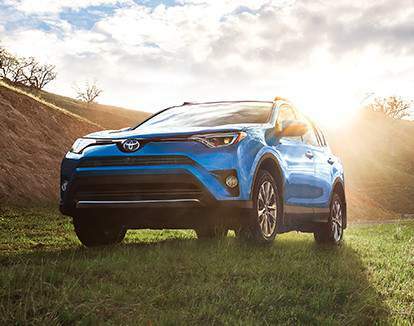 The 2018 Toyota RAV4 meets the needs of families and adventure-seekers alike, blending efficiency, sportiness and advanced tech together in one stylish package. Mayfield Toyota offers a wide selection of RAV4s and has helped customers in Edmonton, Spruce Grove, Sherwood Park, St. Albert, Grand Prairie and across Alberta find the right vehicle for their everyday needs. Book a test drive today and experience the all-new 2018 Toyota RAV4 for yourself.